Tanaka and Daniel have many identities: Brothers, Evolutionites, business owners, and former Protectors known as Dagger and Shadow Ninja. Fighters of crime and keepers of the peace, the brothers go where they are needed to help those in need. A call for help from Tanaka’s ex-girlfriend Nancy sends the brothers to the city of sin: Las Vegas. While in Vegas, Tanaka and Daniel discover Nancy caught up in a plot by an evil robot named Destructo who wants to replace all humans with robot doppelgangers. Can the brothers save the world again? Can Nancy be trusted? Will Tanaka ever be able to forgive her for breaking up with him? 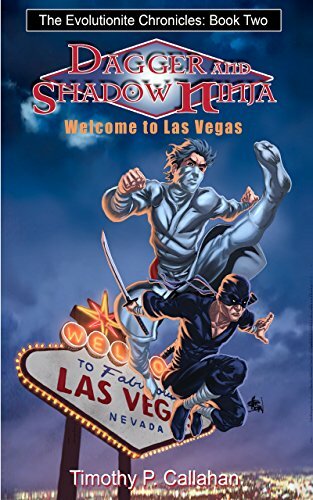 Welcome to Vegas is a fast-paced superhero romp through the strip clubs, casinos, and streets of the most unique city on the planet.